The word “nanga” refers to the “Instrument [zither], as well as to the "Art, Performance and Composition of Traditional Basongora Zither Music.” 'E Nanga' as a music genre encompasses the entire range of musical activities including “the composition [kucwa enanga], arrangement and performances” that are based on the Basongora zither. The main musical instrument of the Basongora - the “e-Nanga” - is a type of zither that is composed of two main parts: the first part is called the “kitara” and consists of the wooden base-frame of the “nanga” zither. The frame is a shallow wooden-trough with "teeth" at the two convex opposite ends through which to run the strings. The trough is carved from the wood of the Nkukuuru tree [Euphorbia Candelabra]. The second part of the Nanga is a single cord made of sinews [ebinywa] from the tendons of a bull. This thin cord is strung over the open upper side of the trough, then through the teeth at each end of the zither frame, until it makes a six-stringed instrument. The nanga (zither) is played by plucking or strumming with the fingers. The only other bits required on the properly assembled “Enanga” are wooden fasteners - small wooden pegs, each about 2 inches long, that are used to tune the zither by tightening or loosening the cord at specific points between the teeth on either side of the frame. In past times the strings used on the “nanga” were made of the tendon sinews from an old bull. Lately, however, the only cords available for stringing the “nanga” are made of sisal or plastic. The nanga that is strung with sisal or plastic doesn't sound as good as the nanga strung with bull-sinew. Sinew is available to use, but sisal and plastic are found everywhere these days and are cheaper to obtain. The Nkukuuru tree [Euphorbia Candelabra] is plentiful in Busongora and is considered sacred among the Basongora. Every Basongora homestead is required to have a Nkukuuru tree in front of the entrance to the yard. In ancient times the monarch of Busongora would meet his subjects while sitting under the shade of a large Nkukuuru tree. In their research on the vegetation of Queen Elizabeth National Park in the 1960s Henry Osmaston and Lock of Cambridge showed that the open savannah and short shrubs were the product of centuries-long fire-management system by BaSongora to curtail overgrowth, and also noted the presence of so many euphorbia trees [enkukuuru] as having been deliberately planted by BaSongora to protect their cattle against raids. Some of the planted euphorbia trees were estimated to be at least 500 years old. Among Basongora, the name “Enanga” does not only apply to the zither instrument. Enanga also refers to the entire range of activities and performances in which the instrument is involved. Enanga as an art form is inclusive of both the instrument and music, as well as the performance associated with the instrument. All elements included in the composition of lyrics and instrumentals are collectively referred to as enanga. Although the use of the zither among Basongora shares many commonalities with their neighbouring communities, many things about the Enanga of the Basongora are distinctive. For instance the use of the word enanga in other communities in Central and East - including Uganda - refers only to the instrument known in English as zither. So the meaning attributed to the word enanga by Basongora is unique and much more extensive. The art of Enanga is one of the most significant aspects of the traditional heritage of the Basongora. The art of music composition [enanga] is meant for entertainment, and takes place during social events that include marriage ceremonies, and the coronation of monarchs. The compositions can be done in praise of a hero, a lover, a faithful companion, and can express the intimacy of loved ones, as well as include the recitation of the genealogy of the performers of other known members of the community. The topics and subjects of Enanga are expressive of the historical events in the life and spirituality of the community, and broadly describe the challenges, aspirations of the people. Enanga is performed during weddings, or when entertaining visitors. 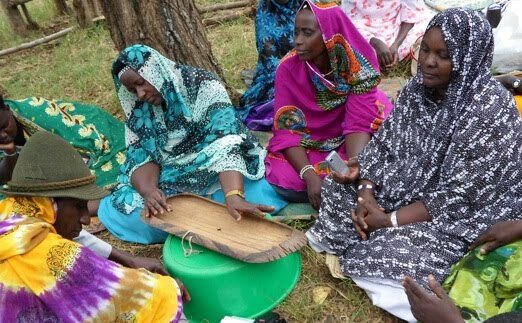 The Enanga is played usually by several women sitting on cow skin, or on mats, in circular formation covering their heads with sheets of cloths [emyenagyiro]. Sometimes the women in the formation can number dozens. 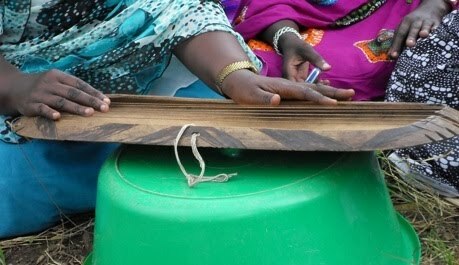 To play, the zither is placed on top of a large down-turned calabash with a hole in the centre. The calabash acts as the amplifier. While one lead performer strums the strings [emigoye], a second performer keeps rhythm by tapping on the calabash rhythmically with the knuckles, all the while vocalists sing [ku-amirra] and “throw the arms”. The men will usually be standing or sitting on round stools [ebi-karansi] and chairs [entebbe] behind the women’s formation. The men will also throw up their arms, and sometimes they will lend their voices to the chorus. Frequently the Enanga performance is done at homesteads after the chores are done, and young children will join in the performance. The performance of Enanga has a historical lineage dating back thousands of years, as attested by ancient images in Africa of the specific design of the zither used by Basongora. Certainly the ubiquity of the zither in African culture speaks to its very ancient origins. Moreover, performances of Enanga tell of ancient events in Busongora’s history, some of which events appear to date back thousands of years. Most important, however, is the fact that although the Basongora community is extremely old, they do not recognize any other indigenous musical instruments besides the zither and calabash. Basongora do not use the flute at all, despite the fact that folklore mentions that at least one ancient king of Busongora, named Ndahura, was believed to have been a prolific flute-player in his youth. Ndahura, however, is also noted to have been the most important figure associated with the cult known as “Kubanda” or “Omwari”, as well as with the transformation of Busongora Kingdom into the short-lived but mystifying Chwezi Empire. None of the informants interviewed in the course of documenting Songora culture ever used the flute. They all claimed it was foreign to the culture. The two places the Basongora credit with the use of the flute - Nkore and Rwanda - were both part of the Chwezi Empire and under Songora hegemony during the time of Ndahura [known in Rwanda as “Ndahiro”]. Ndahura ruled Busongora in the late 1100s or early 1200s. Ndahura’s grave is located on Irangara island in Busongora county in Kasese district. His kraal is in the foothills of the Rwenzori [Rwenjura] mountain above the trading centre of Kikorongo [not far from the current location of the”Queen’s Hut at the main gate of Queen Elizabeth National Park]. If in fact the flute was ever used by Basongora, that adoption may have been short-lived, and took place over 800 years ago, and has since been ignored or shunned as a musical art form. Basongora are also one of the few communities in Africa that don’t use drums, xylophones, gongs, or bells for music. In fact besides the calabash and zither, Basongora have no history of using any other percussion instruments, even though they are certainly aware of these instruments and have ready access to them. The only time the Basongora use a drum in recent times is during the coronation of the Monarch of Busongora Kingdom. The royal drum is used to mark the beginning of a new reign. During the installation ceremony the royal drum is produced, and presented before the new ruler, who then strikes the drum one time only. That drum is never struck again as long as that ruler remains on the throne. Although the enanga tradition is still popular and practised in Busongora, the skills to play and perform the Enanga music have been adversely been affected by the displacement and marginalization of the Basongora in the course of the last 140 years. As a consequence of repression, all Basongora traditions - including Enanga - fell into relative disuse, and have only survived because of intermittent and irregular interventions by individuals with limited resources of skills. The community has not entirely recovered from the past problems, and remains the target of abuse and hostility neighboring communities - especially due to land conflicts. 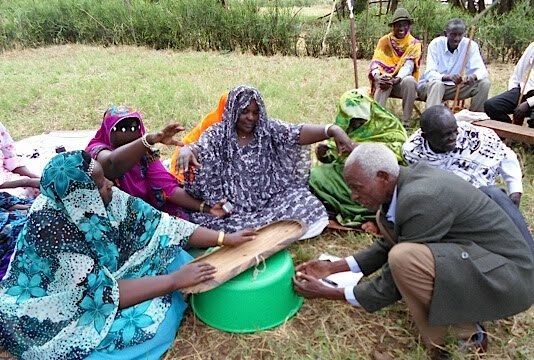 Few elders remember the old Enanga compositions, and many performers have little understanding of the events or traditions that they recite when they perform Enanga compositions from the past. It is possible a lot of valuable Enanga compositions will never be fully recovered or reconstituted. Moreover, as the old generation passes on, more traditional compositions of Enanga could be lost - few young people know how to perform the simpler music in Enanga. Fewer still have mastery of the complex vocal skills required to sing in the correct traditional sound of the Basongora “nanga”. The conventional education systems in place in Uganda and Congo do not give sufficient time for transmission of enanga between the community elders and the children, consequently leaving the young unmindful to learn, and thus endangering the survival of the Enanga art-form. Over the course of several past decades, there are several recordings of Enanga performance that have been captured, but are not easily accessible to the public. These recordings were done by an independent researcher - Professor Mbabi-Katana - who recorded audio material for Enanga music and recorded performances which took place beginning in the late 1960s. Some of those performances were broadcast on Radio Uganda [now called the Uganda Broadcasting Corporation]. The introduction of a cultural day [Enkomi] by the Basongora Inter-University Students Association [BIUSA] has also helped to expose members of the public and the student populations in Kampala -Uganda’s capital city - to Basongora culture. Annual performances and exhibitions of Basongora crafts are now done at various universities and schools during the cultural festivals. Despite the hindrances and limitations, enanga is still performed at the traditional Songora functions, especially at weddings. Various women’s cultural groups still offer crowd-pleasing performances. The cultural and performing groups of enanga are established in the areas of Nyakakyindo, Muhokya, Nyakatonzi and Busunga, all in Kasese District, in western Uganda.